Dee Why Beach Corso has been stylishly designed with a mix of stainless steel street furniture, picnic tables, elegant looking lamp posts and shower units. Breakfast at Dee Why Beach, at one of the cafes on the beachside strip, is a great way to start the day. A promenade, grass picnic stretch and road separates the cafes from the soft sands but does not detract from the views of the glistening seas. Most cafes offer both alfresco and inside dining. This image belongs to the travel and nature stock photo library. This stock photo of Dee Why Beach Corso at Sunrise is available for licensing for commercial and editorial uses including websites, blogs, books, magazines, brochures and advertising. Restrictions may apply for images which contain third party copyrighted material or sensitive subjects. Photos of artwork are for editorial use only. 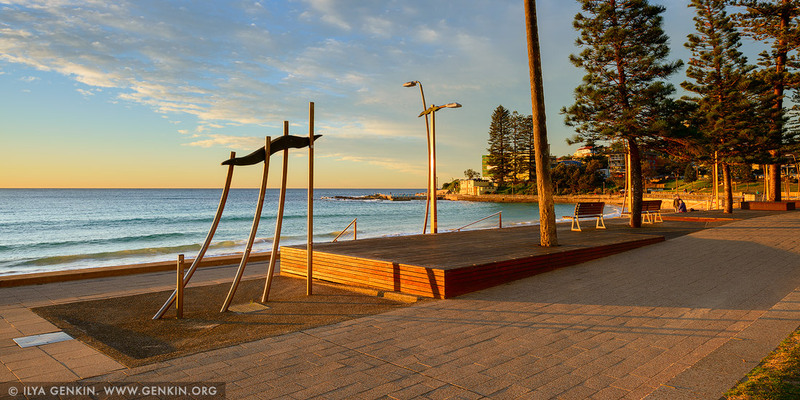 This image id AU-DEE-WHY-BEACH-0002 of Dee Why Beach Corso at Sunrise, is copyrighted © by Ilya Genkin. This is not a public domain image.